This book really impressed me. The story itself is about a bully tormenting her classmates and her classmates learning to stand up for themselves and their peers. When a student goes to her mother looking for advice, the mother comes up with a genius plan. Magic "Bully Beans".....special jelly beans that give you the courage and confidence to stand up to a bully. 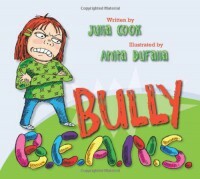 The book offers great advice on how to handle bullies and good strategies to come to a good outcome. It also asks thought provoking questions asking why the child is being a bully. I would use this book in grades K thru 4th. This book I would incorporate into the reading section of the day. In the lower grades I would work through the book as a whole group breaking it down into KWL. In the upper grades I would break it down into literacy centers.